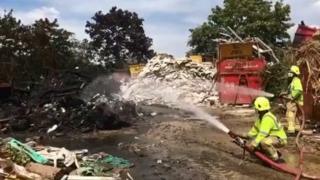 A skip yard owner was called away from his own wedding reception after 400 tonnes of waste went up in flames at his family business in Surrey. Forty firefighters tackled the blaze at R&S Etherington Ltd Skip Hire in Smallfield, near Horley, on Saturday evening. Robert Etherington said the fire would cost the business at least £100,000. CCTV showed the fire started at the back, near a field, where people had previously broken in to steal metal. "We can't work at the moment," he said. "We are diverting skips and we don't know how long it's going to take." Surrey Fire and Rescue Service said the fire was brought under control by the early hours by nearly 40 firefighters, but crews would remain at the scene in Normans Corner, Chapel Road, for days. A spokeswoman said crews were damping down and clearing up, with fire engines present and diggers. The cause of the blaze is being investigated, she said. The Environment Agency said it was working to establish any impacts on air quality and watercourses. "The majority of the fire is now out but the fire service expect to be on site throughout this week to move waste and dampen down the inner parts of the stockpile," an Environment Agency spokesman said.